Even though I am a Summer Chick, I still feel that one of the best times of year is the fall. When the weather starts cooling, the leaves begin to change into beautiful scenery and of course football season begins. You already know we are quite the entertaining family that throws a party every excuse we get! We also love to tailgate any time we can and frequently try to throw football parties for any game we can (especially when not in attendance). We also love camping even though we don't get the chance to do it as often as we'd like. Because of our love for the outdoors, this usually this means grilling for breakfast, lunch, and dinner if we can! 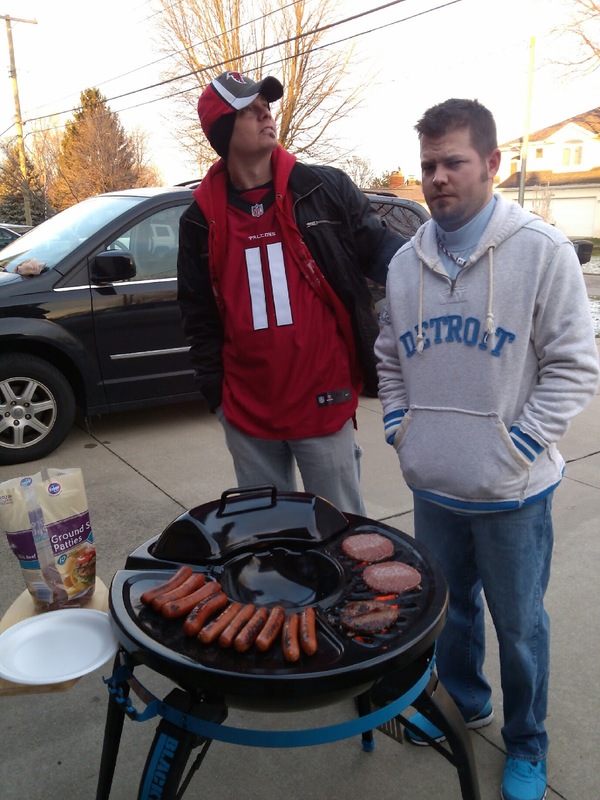 Our tailgating actually happens throughout the year whenever we can find a reason. Whether its camping, concerts, sporting events, or just an away from home gathering - we are guaranteed to be there grilling food and drinking beer! 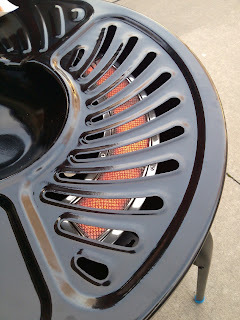 Earlier this year I found myself gawking over some of the fancy grills others had when we were out tailgating and I was determined to have one of my own, but way COOLER! I of course searched and searched online until I could find something unique. And then I came across Blacktop 360 Party Hub Grill-Fryer. 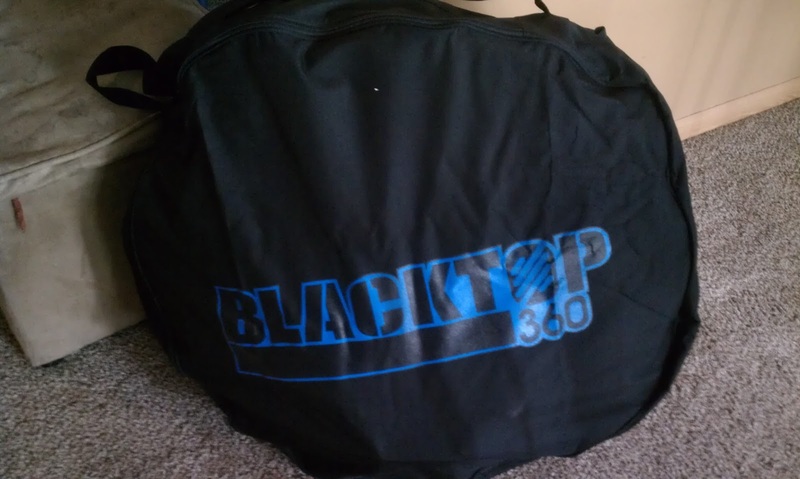 After checking out the features, I knew this was the grill WE had to have to I contacted Blacktop 360. They graciously agreed to send me one of their grills to give a try and I immediately bragged to my tailgating friends. I knew this was going to make for a great football season! Once the grill arrived our anticipation quickly grew as we knew we would have to wait to use it for a couple weeks until our big football game. This does not mean we didn't pull it out frequently when others were over to show off or have it sitting in our living room to admire half the time! One third of this circular grill is the patented HELLFIRE ceramic infrared burner which can cook up to a temperature of 650°F+. If you know anything about infrared - it has the ability to quickly cook any type of meat or quickly sear meats for those rare meat lovers. 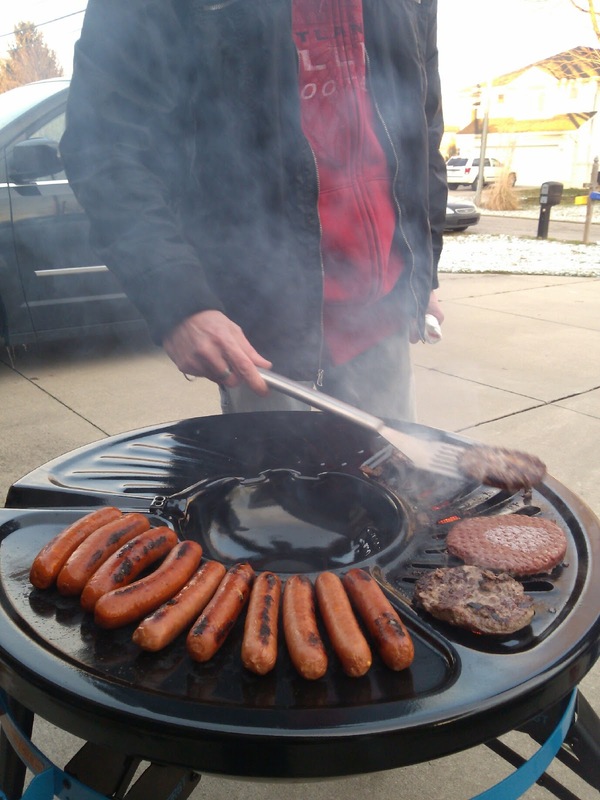 The griddle also takes up another 3rd of the grill and is the perfect for the early breakfast tailgating or even making grilled cheese or panini sandwiches for everyone. 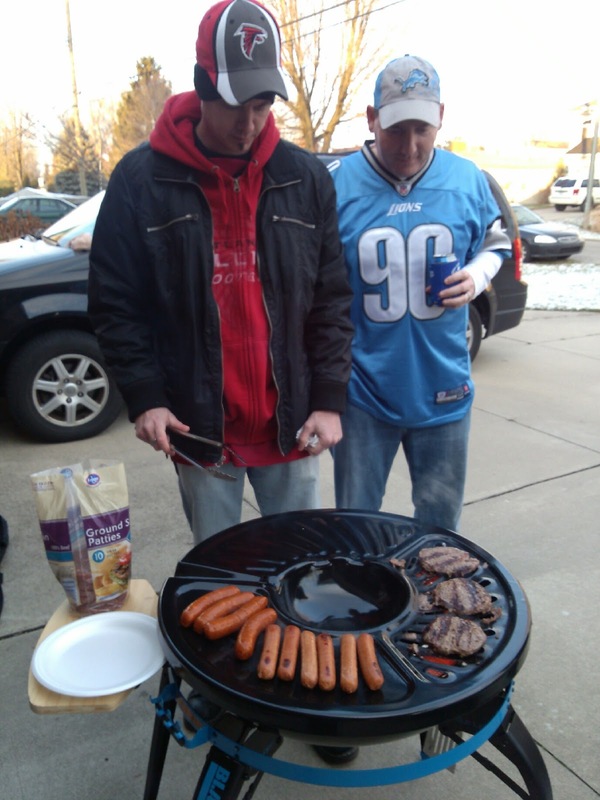 As you can see we even used the griddle to cook up our brats for the big game! Of course with one third of the circular grill left what better than a warmer plate to keep your buns warm or anything that comes off the grill. We used this to hold everything nice and hot while we all waited for my husband to finish up the last of the pre-game meal. 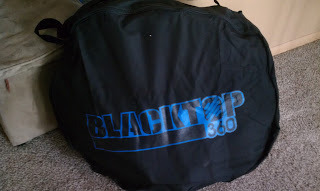 Finally the center of the Blacktop 360 is a patented deep-frying well with capacity of 20 oz. Impress your friends with the ability to cook up onion rings, fries, seafood's and meats extremely fast. "The Grill-Deep Fryer is packing over 24K in BTUs and a ridiculous 452 square inches of cooking surface." It is extremely durable made with a double porcelain enamel cook surface, stainless steel burners, ceramic infrared burner, and electronic pulse ignitions. There is even an accessory rail for cutting boards, tools, and food preparation. Accessories included are a cutting board, slosh ring, thermometer, insulated liquid catch bottle, three-position cover, and storage/carrying bag. There is also a metal ring wrapping around the bowl where the accessories can attach as well as notched handles to hang grilling tools such as tongs, spatulas and strainers. All in all this was an awesome tool for tailgating of any kind! It would also be really awesome to take camping and we sure plan on using it! 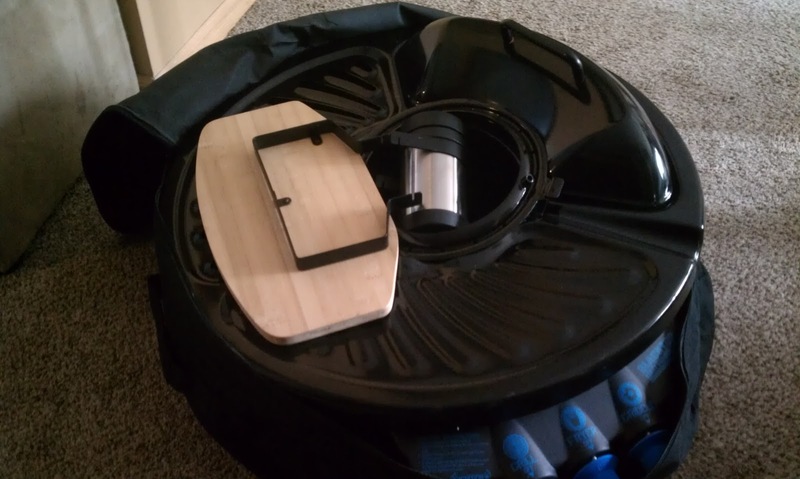 My only complaint/area of concern was the cleanup. We decided it would be best to let the grill cool and clean with a plastic scrub brush so we wouldn't scratch any of the coating. Although we haven't used the fryer portion yet that would also be an area of concern with cleanup. Otherwise I feel like the coolest kid on the block with a shiny new toy to show off to everyone. Peoples attention was definitely focused on us as we cooked up and enjoyed a gourmet meal for a football game! Recommendation: Ok so I really want to tell you not to get this so I am the only one with this awesome tool but in all honesty that wouldn't be very fair would it!? So yes go grab yourself one! 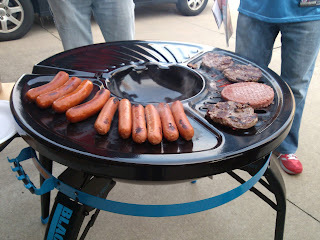 This is definitely worth the money and the cost is maybe only a tad bit over the average price of a tailgating grill. However you are not going to find anything similar and as easy to use! 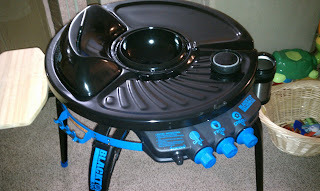 Giveaway: Blacktop 360 is going to give one of A Lucky Ladybug's lucky readers a Blacktop 360 Party Hub Grill-Fryer of their own! *This will be part of the "Sizzling Superbowl Tailgating Giveaway" event which goes live 1/4/13 so keep a look out for it.